For this fourth day at COP22, the Nuclear for Climate team wants to talk about Young Generation and Action. We exchange a lot with different people from other energies such as methanisation or concentrate solar and photovoltaic about the whole carbon balance of our industries, these very interesting talks are related to waste management, impact on the Environment but also human capacity building, education and sustainable development of African and South-Asian countries. That is the slogan of COP22. It was also the main topic of the Youth conference in the Arabian room (area E) this morning where, of course, the Nuclear for Climate Young Generation went. This conference entitled « How engaging Youth actions are integral to implementing the Paris agreement and climate justice » organised by UKYCC begun with the intervention of « Make it real » born after the Conference of Youth (COY11) in Paris whose purpose is to make young people find solutions through workshops in France, Benin and Japan. We had after that a very interesting presentation of SYAH (SIDS Youth Aims HUB) which has organised many action and information campaigns in different islands (Seychelles, Comoros, Madagascar…) from trash cleaning of a University to ocean cleaning of plastic and other trash. The conference ended with the presentation of « eco-lead » from the Peking University, a group of students decided to implement a whole recycling program of paper and plastic in the university. After the conference, the session became more interactive, everyone had to draw the river of their « climate change journey » to COP22. Our drawings were personal and have been let in the conference room but we decided to do the exercice again as « Nuclear for Climate YGN ». The « Nuclear for Climate YGN climate change journey » has really began in 2013 when the European Nuclear Society Young Generation Network (ENS-YGN) has decided to dedicate ENYGF2015 to Nuclear and the Environment and organise it in Paris. This was the first stone of our action regarding climate change. From that point, to build a very accurate program we had to think and understand what are the impacts of Nuclear on the Environment and what are the strengths and weaknesses of our industry. The second main step is the creation by the senior associations of Nuclear for Climate and the proposal they made the different Young Generation Networks to be a part of it. The first main action we had was about the organisation of this important conference dedicated to the impact of Nuclear and how to improve it. We decided to talk about the whole cycle from mining to waste management going through the fuel cycle and nuclear power plant exploitation phase. The second one we had in parallel was to think about what as a Young Generation we wanted for the Future. This lead us to write the European Position Paper on Nuclear and Climate Change. This position paper have been followed by an international position paper made by the IYNC network to inform people. 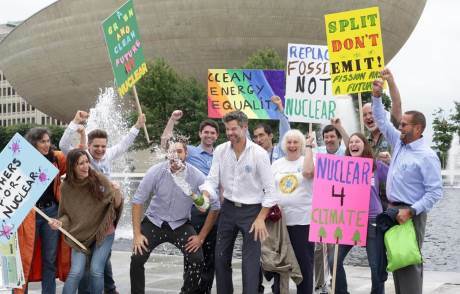 Action for the Nuclear for Climate Young Generation means inform and debate with people. This entry was posted in COP, COP21, COP22 by Martin Boissavit. Bookmark the permalink.